Debby Neuman is a mother, childbirth educator, doula, massage therapist, and spiritual teacher. 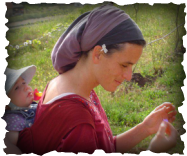 She is sought out by women seeking inspired, empowering, and spiritual childbirth experiences. She teaches classes that help people relax, question, analyze, explore, and connect more deeply with themselves and their roots. Debby received certification as Doula and Thai Massage Therapist from Reidman International College in Jerusalem. She is also certified in Swedish massage and acupressure from Tzabar Holistic College in Jerusalem. She has been blessed to learn with some amazing teachers of Torah, spirituality, and Polarity therapy. Debby uses her training, experience, and knowledge of ancient texts to enhance her classes where she shares the messages about birthing and feminine strength that are inherent to our tradition.